Training courses are specifically designed to help businesses comply with workplace first aid requirements. The instructional design of MEDIC First Aid training programs uses a video-based, instructor-facilitated, systematic approach that helps to ensure consistent training. MEDIC First Aid programs conform to national and international standards and are based on the same scientific guidelines and treatment recommendations used by the American Heart Association (AHA), European Resuscitation Council (ERC), International Liaison Committee on Resuscitation (ILCOR), British Resuscitation Council (BRC) and others as well as American Red Cross (ARC) for course development. MEDIC First Aid is consistent with OSHA’s best practices for first aid training programs. Lets have a look at the topics covered in the course. First Aid to Save a Life is approved training center for MEDIC First Aid International training programs. Our trainers are approved by MEDIC First Aid International and are entrusted by many of the leading organizations to train and retrain their workforce. The status of our training center and our instructors can be checked online from Health & Safety Institute. First Aid to Save a Life is driven by strong management commitment. Policies, mission statements, guidelines from MEDIC First Aid and HSI and internal procedures are in place to guide this business and ensure our customers (students, companies, etc) that we will fulfill our commitments and ensure their applicability at all levels. Legal Compliance: Our training courses enable you to meet your legal obligations as an employer. Our training courses fulfill the requirements of Occupational Safety and Health Administration (OSHA) and Occupational Safety and Health Act of 1970. 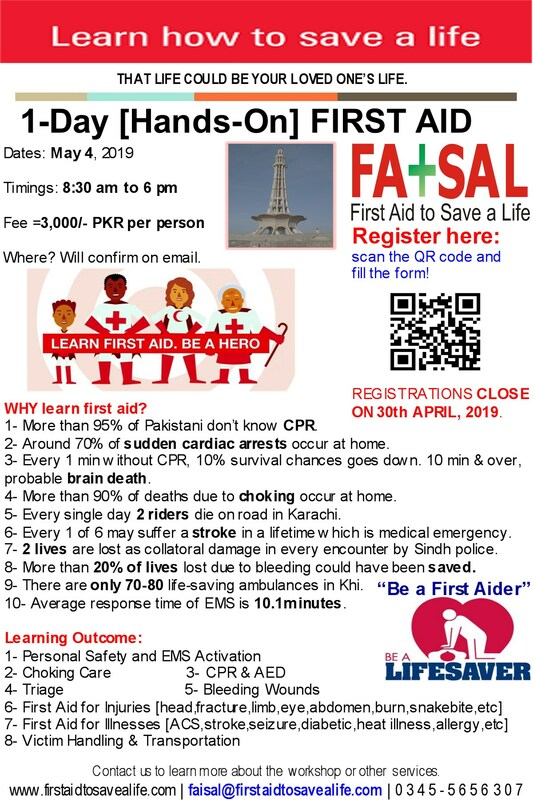 Further to aforementioned, let us assure our local students and customers that the requirements mentioned by local regulations and laws, entailed in the Pakistan Factories Act 1934 and the Factories Rules 1978 are met by these MEDIC First Aid training programs. Company Well-being: Courses contribute to the health, safety and welfare of all your employees, reducing the effect and seriousness of any accidents or injuries that occur in the workplace. As this course gives participants the skills and knowledge of basic first aid needed to be able to deal with the injuries most likely to occur in everyday life. Satisfied People: Attendees complete our courses with a real sense of achievement, and are equipped with a rewarding new skill set. 01:- Certification: Successful participants will receive (individual) successful certificate with 2-years validity (requiring annual refresher) card from MEDIC First Aid International. 05:- Safe and effective first aid response techniques based on G2015 Guidelines for CPR and First Aid. 06:- A proven “seeing, hearing, doing, speaking, feeling” approach to learning. 07:- Low-stress training with user-friendly materials and positive coaching. 08:- Significant classroom time for hands-on practice. 10:- Professional adult CPR-AED training manikins (with CPR monitor) for realistic experiences and feedback. 12:- First aid supplies for pure training purposes. 13:- Training booklet, wallet card, certificate, lunch and tea are included in course fee.